Car window tint is one of the best ways to improve the look and comfort of your vehicle. As you drive, you’ll find that your vehicle is much cooler and more comfortable. It also makes the glass safer and the interior is less likely to crack or fade. 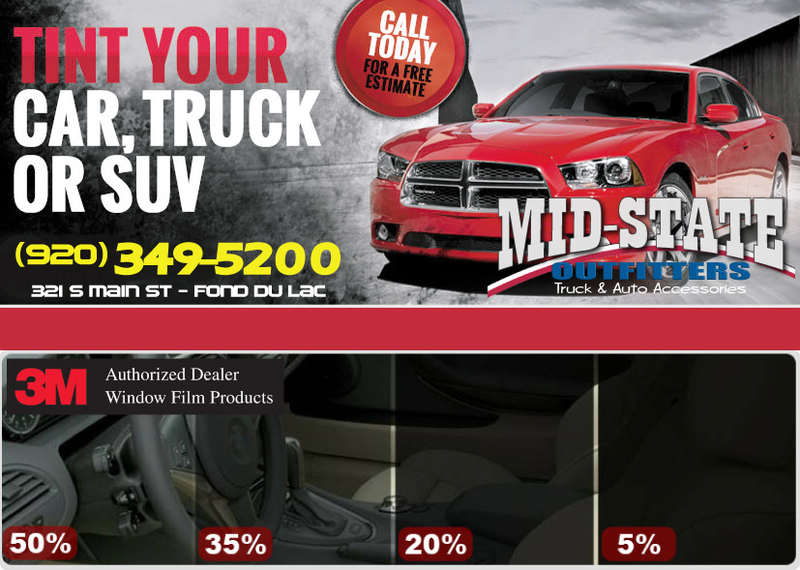 Midstate Outfitters car window tinting provides cool vehicle protection from the sun’s destructive rays by creating a permanent barrier between your vehicle’s interior and the outside world. Auto manufacturers produce cars with high-grade leather and suede interiors, making it increasingly crucial to protect these interiors from fading and cracking. Window tinting your car will keep the interior cooler, and help protect your dashboard, seats, carpets, floor mats, vinyl, and leather. Plus, your air conditioner won’t need to work as hard, so you’ll save fuel and help extend the life of your vehicle’s air conditioning system. 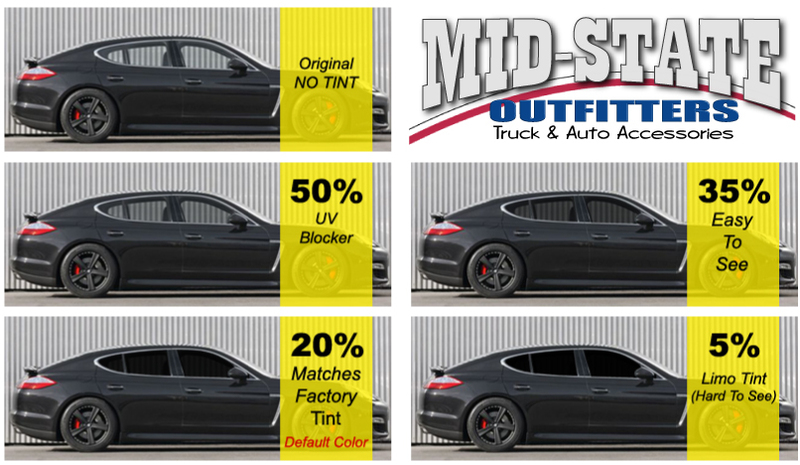 Midstate Outfitters ® car window tinting cuts the sun’s dangerous UV-A and UV-B rays. The “Skin Cancer Foundation” reminds you that time spent in the car puts both drivers and passengers at risk of skin cancer and other health conditions such as melanoma, cataracts, extra light sensitive eyes, and migraine headaches. The sun’s UV rays can easily penetrate car windows, but since UV-protective car window tints and films block up to 99% of the suns cancer-causing damaging rays, car window tinting is a reliable way to reduce your cancer risk. Additionally, car window tinting cuts down potentially dangerous glare from the road, reflective surfaces, and other vehicles’ headlights at night. * Your vehicle will be Completed the same day! * We are a FULLY INSURED Facility! Vehicle and car window tinting is an affordable way to save money, energy, and improve the overall value of your vehicle. Contact us for tinting prices and start improving the value, safety, and efficiency of your vehicle with Midstate Outfitters car window tinting.